Good and Bad Memories are the part of every students’ life in a college. When a student enters the college, they need to adjust themselves to the new family. But the time spent in college days can’t be expressed. To memorize those events and achievements, Arya College of Engineering and IT is going to organize Top Guns 2k18 on 27th March 2018 at Arya 1st Old Campus. This event of Senior Farewell Party will be organized for the students who have reached the final term of their college Journey by their juniors. This fiesta is devoted to the years spent together with teachers and friends to reminisce joyous moments. The event comprised of several programs that include Special performances by the juniors in Dance, Singing, mimicry and various others. 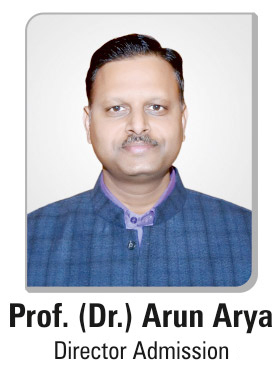 The Chief Guests of the program will be Dr Anurag Agarwal. It will start in the evening at the college Campus. Also, there will be some funny awards for the students who have portrayed their unique characters in their college days. All the Decoration and Arrangement were done by the students only. For the selection of the Winner, different rounds were arranged that will be performed by the senior students who will participate in the Best Student or Mr. and Ms. Farewell. Also, Different kind of unique and interesting awards are also decided to create excitement and interest of the senior students in the event. This event is arranged for the students of all Departments. The chief Guest will motivate the student and guide them. Also, students will be distributed with mementoes as a token of love and appreciation. In The end, there will be special Dinner arranged for students, staff and other team members. It will be a very big and special day for juniors as they could enjoy and learn something new with their seniors for the last time in the college campus. For the seniors, it will be memorable because this is the end to their College life, to the Fun and Activities of the college and other Good and Bad time spent with the teachers, Mentors and Students during their college days.